Our professional team of technicians will guide you through an easy process of repairing your appliance. We strive to provide you the urgent service you want, with our award winning call answering center and a computerized ticketing system. Our trained technicians have the right knowledge and experience to diagnose and repair your appliance in a short timeframe. You'll be glad. At A-best you will be explained exactly what's going wrong with your appliance and we will help you understand the final costs. 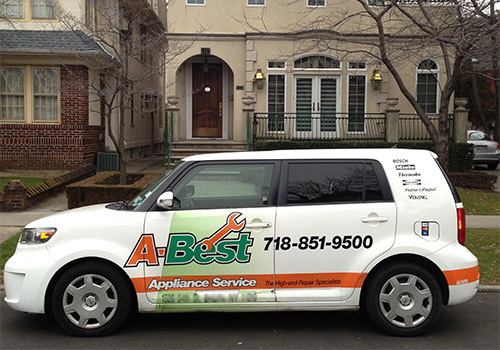 A-best Appliance Service repairs all major brand appliances in NYC. We come down to your location in Brooklyn Manhattan and Staten Island. We also service the Bronx and Queens areas. Our technicians diagnose ,repair and install all major appliances, including refrigerators, freezers, washers, dryers, dishwashers, stoves, ovens, ranges, all types of air conditioners, furnaces, boilers, hot water heaters and many more.